Have you heard? A new version of the Form I-9, Employment Eligibility Verification, was released on November 14, 2016 and employers must begin using the new form by January 22, 2017. These new changes were created to help simplify the overall I-9 process. HireRight has partnered with Dave Basham, from the U.S. Citizenship and Immigration Services, to answer your common Form I-9 questions. Dave has conducted over 450 Form I-9 and E-verify presentations and has won numerous awards, including SHRM’s “Fried of HR” award. The following are six of the most frequently asked questions Dave has received. Question 1: Are employees now allowed to put PO Boxes in the address space? Answer: It is preferred the employee list a physical address in section 1, if possible. However, if there is no physical address to list, it is now acceptable to list a PO Box address. Question 2: Is the QR code required on the Form I-9? Answer: The electronic Form I-9 automatically generates the QR code once it is completed. Forms completed manually will not have a QR code. A form I-9 is valid without a QR Code. Question 3: Is the M-274 updated to reflect the new Form I-9 and its new guidance? Answer: The M-274 is being revised to accommodate the new Form I-9 and all changes. Unfortunately, an exact date as to when the new manual will be released has not been given. Question 4: Can the new Form I-9 be downloaded with any software? Answer: No, in order to download and view the Form I-9, you must use the most current version of Adobe Reader. Question 5: Is it a requirement to provide the 15 page revised Instructions for the new Form I-9? Answer: The employer must ensure that all pages of the instructions and Lists of Acceptable Documents are available, either in print or electronically, to all employees completing this form. The manner in which you do this is a business practice and is at the discretion of your company. Question 6: Does the preparer/translator box have to be checked in section 1, even if a preparer/translator wasn’t used? These new changes to the Form I-9 are now in full affect. All employers or organizations that have U.S. based employees will need to adhere to these new changes, along with the other stringent rules of the Form I-9. For more information and answers to your questions, please watch our recent Form I-9 Webinar with Dave Basham, or download the presentation here. Dave Basham, USCIS, prepared these materials for HireRight for informational purposes only. These materials are not intended to be comprehensive, and are not a substitute for, and should not be construed as, legal advice. Dave Basham, USCIS, and HireRight do not warrant any statements in these materials. Employers should direct to their own experienced legal counsel questions involving their organization’s compliance with or interpretation or application of laws or regulations and any additional legal requirements that may apply. 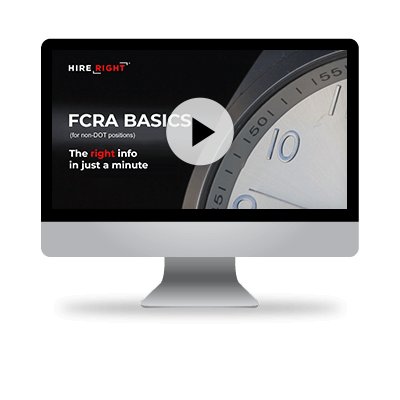 Watch our on-demand video to hear from Form I-9 expert, Dave Basham as he outlines the changes with the new Form I-9 to assist you with your Form I-9 processes and compliance.